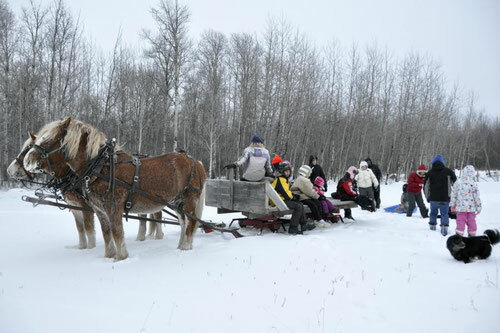 The New Year started out with a sleigh ride at George Millar's for kids, friends and family. Butterscotch got trained to pull the sleigh with Schnapps. In the beginning she was excited and ran away a couple of times. But the team had to work hard through the winter. They fed bales and oats to the calves and young cows. We unrolled the hay bales and moved the oat pails with the sleigh. By the end of the winter Butterscotch was in a good shape and she didn’t run away anymore. Newton and Nancy hauled bales from Goodsoil to the ranch for the cow herd. The young bulls got castrated with our new small, handy elastrator. The girls got all the bulls elastated in a short time. 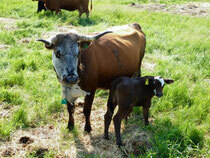 In April the calving season started and we had nice weather with dry ground. The first calves came without trouble and got branded and sent off to the community pasture. We had lots of twins last year. Genie (one of the older cows) had white and black bulls and we named them Max and Maurice. They were a bit weak, but we separated them and left Max with his mother and Maurice got a new mother. They both grew into nice yearlings. One day Kelly and Nancy found a cow in labor with her placenta hanging out. We brought her in and Kelly and Michel (German helper) pulled out a nice black heifer. We hung her upside down on the fence so that the amniotic fluid could drain out of her lungs. Kelly checked the cow again and surprise! There was another calf in the cow! So we got the next set of chains and pulled the next calf out. She was the same size as her sister and both calves were big, strong and healthy. The cow had enough milk to feed two calves, so they stayed together in a little herd next to the house. A few weeks later we had another exciting event on the ranch. A cow in labor was having troubles since the calf was twisted upside down and the new vet came to help us. She tried to pull the calf out and even with Leonard helping nothing happened, the calf wouldn’t move. So the vet decided to have a c-section; she prepared everything for it and started. Unfortunately then the cow decided to lie down and would not get up. That made it extremely difficult to do anything with the cow lying on one side. Dr. Ed had to come and help. Although he got the calf out it was already dead, but the cow survived and a day later she had a foster calf sucking her. We also had Dandy in the yard again. She had a nice bull calf and we called him Dan. We milked Dandy a couple of times a day throughout the summer, but always made sure that Dan got enough milk. Every so often we had a cattle drive and moved the cows, calves and yearlings to the summer pastures at the North Ranch and Rapid View. We helped at brandings here on the ranch and at the neighbors. Later in the summer we replaced lots of rebar with wooden post on the ranch and the north ranch. There were spots where we couldn’t use the post pounder, so we had to put the posts in by hand. Fence building and rebuilding was our main job in July and August. At the end of July we also had a bad storm with wind gusting up to 130 km/h, that ripped out trees and fences all around the yard, the ranch and the lake. One tree missed the house by about 2 meters, trees were on fences, blocking alleys and blocking all the trails down to the lake. Big wooden fences with uprights fell down next to the barn and in the east pen. So we got out our little chainsaw and cut wood all August. We had help from Marilyn and her crew fixing fences and cutting more trees off the fence for the next few months. Later in the fall we got Howard to make some planks and uprights for us. In the winter we finally got to fix the wooden fences and all the pens were fenced up. A few of our helpers went out to the Meadow Lake Park in the summer and enjoyed some nice days riding and swimming. At the beginning of September the Prairie n Forest club had their annual horse show at the Meadow Lake Stampede Grounds. Riders between 3 and 65 years had lots of fun competing in English and Western classes. In the fall Newton and Kelly started to haul logs with the 2011 Mack. Newton taught Kelly all the tricks and hints about hauling 75 tons of wood up and down the hills in the north of Saskatchewan. When Newton and Kelly were out hauling logs, Nancy and the crew took care of the ranch and the cows. Marilyn and her crew helped when they could, to bring the cows home on cattle drives, to vaccinate calves and check cows. We had a beautiful and long fall last year. The cows could eat grass until the beginning of December. The heifers in Radisson could stay down there until December. Julia (Austrian helper) and Nancy went to Radisson with truck and trailer loaded with two horses and panels early on a December morning. They built a small pen next to the trailer and got the herd of heifers into the pen (some oats were in there as treats). Later Steve came with the big semi and cattle trailer and hauled the herd home. Julia and Nancy put the panels and horses back in their trailer and took off to Meadow Lake too. 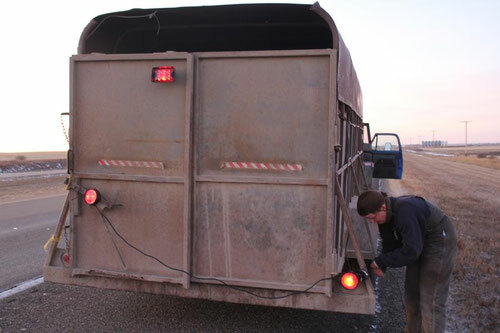 Due to a few light troubles on the trailer, they arrived later in the dark with just one light working on the trailer. They were glad when they saw the yard lights and were home. We didn’t have much snow, so we had to water the cow herd at the water bowl next to the big barn. The cows came in every morning and all tried to drink at the same time. They didn’t understand that the water is there all day long! The calves stayed with their mothers until early winter and then we weaned them. The calves got fed oats every morning plus their hay unrolled in the pen. Nancy started hauling bales when Kelly had her days off from hauling logs. Before Christmas Newton had to go to the hospital in Saskatoon and stayed there until after New Year. The family spent Christmas in Saskatoon and took care of Newton. Nancy and the helpers worked on the ranch and spent Christmas with the Brown brothers, at George’s and at Marilyn’s.